This month’s recommendation from Oxford University Press: Gebhard Bücheler – Proportionality in Investor-State Arbitration. While international investment law is one of the most dynamic and thriving fields of international law, it is increasingly criticized for failing to strike a fair balance between private property rights and the public interest. Proportionality is a tool to resolve conflicts between competing rights and interests. This book assesses its current role, its potential, and its limits in investor-State arbitration. Proportionality is often lauded for reconciling colliding interests. This book identifies three factors arbitrators should consider before engaging in a proportionality analysis: the rule of law, the risk of judicial law-making, and the availability of a value system that guides the proportionality analysis. 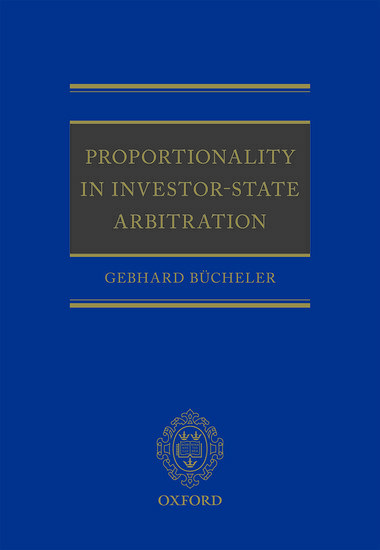 Apart from making suggestions when arbitrators should apply proportionality and when not to, the book outlines what States can do to recalibrate the balance between private property rights and the public interest if they wish to do so without dismantling the current system of investor-State arbitration. Proportionality in Investor-State Arbitration considers whether and to what extent the notion of general principles of law within the meaning of Article 38(1)(c) of the ICJ Statute and the concept of systemic integration enshrined in Article 31(3)(c) of the Vienna Convention on the Law of Treaties provides a valid legal foundation for applying proportionality in investor-State arbitration.